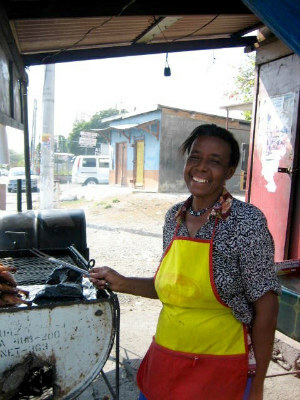 As spring slowly approaches, imagine yourself in sunny Jamaica, where spicy jerk is the star of the barbecue scene. We’re continuing with our series of grilling destinations around the world (see what Argentina and Singapore have to offer) as featured in my book, Planet Barbecue! When it comes to barbecue, Jamaica has only one trick up its sleeve. But, oh, what a trick. I’m talking, of course, about Jamaica’s national dish—and cultural icon—jerk. Once you’ve tasted this fiery smoke-roasted pork, sweet with allspice, fragrant with island thyme, and above all, electrified with more Scotch bonnet chiles than you’d ever thought humanly possible to consume, well, a trick becomes a miracle and that sleeve a rich brocade. 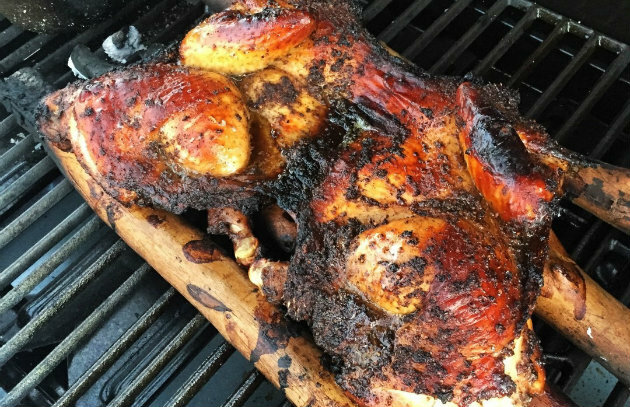 Like so much West Indian cuisine, jerk represents a fusion of peoples and cultures: indigenous Caribbean ingredients, an ancient Taíno Indian cooking technique, an African penchant for highly spiced foods, and even an act of political rebellion. The native ingredients include pimento (allspice) berries, Scotch bonnet chiles, and a local green onion called escallion. 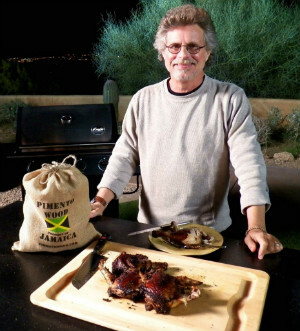 The cooking technique involves roasting meats on a spicewood grate over a low smoky fire. As for the political rebellion, the Maroons, runaway slaves in the mountains of Jamaica who became the first black freedom fighters in the western hemisphere, nourished their troops on this salty, smoky, fiery meat. Jerk has very likely been on Jamaica’s menu since before the arrival of the first European colonists. Here’s how one 17th century visitor from England, Hans Sloane, described an early version: “Swine … pierced through with lances, cut open, the Bones taken out, and the Flesh is gash’d on the inside into the Skin, fill’d with Salt and expos’d to the Sun, which is call’d jirking.” The word jerk may come from the Quechua Indian term ch’arki, the origin of our word jerky, or it may have originated from the Jamaican patois, where jook means to stab or pierce. 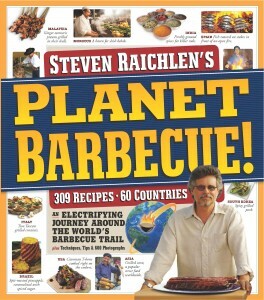 Adapted from Planet Barbecue! For a complete tour of the world’s grilling cultures, click here.